Over the last several weeks Spring has arrived in southern New Hampshire. The tulips are up, the lilacs are in bud and the wisteria is about to blossom. This explosion of color in the garden brings to mind one of my favorite gemstones found in antique cufflinks - Moss Agate. Moss Agate is a beautiful variety of fine grained quartz shot through with green or earth-tone inclusions. This alluring gemstone is found in several flavors. Montana Moss Agate is a translucent milky white speckled with dark inclusions resembling small patches of moss or lichen. Another variety, Mocha Stone, was favored during the Victorian era. Mocha Stones were often set in cuff buttons and watch fobs and feature fantastic dendritic forms resembling the spreading branches of a miniature tree. 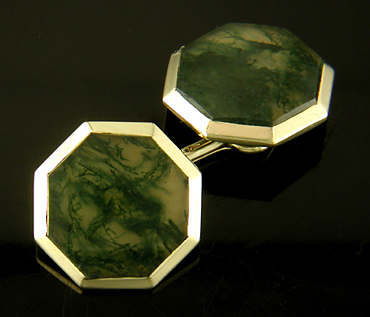 Carter, Howe Octagon Moss Agate Cufflinks, circa 1900. 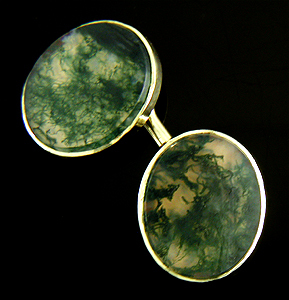 However, the Moss Agates favored by cufflinks makers in the early 1900s are best described as "Seaweed" Agates. These beautiful gemstones have the mesmerizing appearance of green seaweed floating in a sunlit pool. When backed with mother-of-pearl or other white material and set in yellow gold, the effect is striking. Among the premier makers of elegant cufflinks and dress sets in the early 1900s was Carter, Howe & Company (Carter, Gough & Company after 1915). The firm created a dazzling array of cufflinks and dress sets featuring Moss Agates set in 14kt gold. Pictured above are several fine examples. In the early 1900s, the firm appears to have specialized in creating fine cufflinks featuring unusual gemstones. Examples can be found set with Bloodstones, Onyx, Moonstones and other exotic gems. These lesser known gemstones were sometimes erroneously referred to as "semi-precious gems" - a misnomer belied by the beauty of the cufflinks in which they were set. 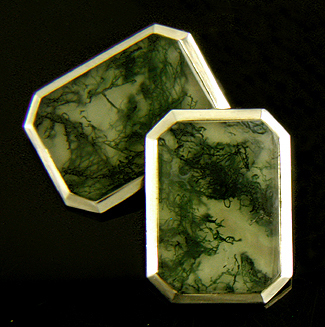 S&N Moss Agate Cufflinks, circa 1920. Another firm that worked with gemstones beyond the traditional sapphires and diamonds was Sansbury & Nellis (S&N). Like many of the fine cufflink and jewelry makers of the day (including Carter, Howe), Sansbury & Nellis was based in Newark, New Jersey. From the style of its cufflinks and notices in the trade press, the firm appears to have operated from about 1900 until the 1930s. Pictured above is a beautiful pair of Sansbury & Nellis cufflinks featuring oval Seaweed Agates. The gemstones have nicely bevelled edges and are set in bright yellow gold. A nice example of the firm's work. please visit Antique Cufflink Gallery. Recent additions to the Antique Cufflink Gallery include ferocious winged lions, beautiful Moss Agates from Sansbury & Nellis, elegant onyx and gold octagons, and jazzy white and yellow gold cufflinks by Ziething. Roaring Lions! A menagerie of mythological and exotic creatures inhabit antique cufflinks. These cufflinks feature a roaring lion with avian features. Crafted in 14kt gold, circa 1910. 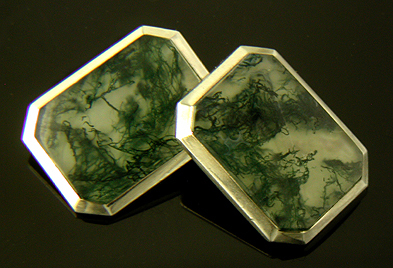 Moss Agate II Beautiful antique cufflinks featuring fine Moss Agates with the appearence of dark green seaweed floating in sunlit water. Crafted in 14kt gold, circa 1920. Elegant Onyx! Some of the most elegant cufflink designs are the simplest. This pair of antique cufflinks features creamy black onyx set in octagonal yellow gold frames. Crafted in 14kt gold, circa 1920. Golden Ovals! Jazzy white and yellow gold cufflinks featuring radiant yellow gold centers surrounded by dramatically engraved white gold borders. A beautiful example of jazzy Art Deco design. Created by Ziething & Company in 10kt gold, circa 1925.